Chennai, Aug 27: Tamil Nadu is a typical example of thriving electoral democracy. Managing elections is a virtue here. People think voting is not just a necessity, but a duty which cannot be shirked. The popular image of an old lady being carried to the booth by her grandson in the recent byelections is proof for the culture of voting in the state. AIADMK supremo Ms Jayalalithaa’s call for boycott of bypolls is misplaced for several reasons. Elections are like annual festivals in the temple of local deity. Exercise of franchise is meant for celebrations in rural Tamil Nadu. It gives people a sense of self-importance. The only reason for anyone to stay away from polls is extreme illness. “Voting is proof that I am still alive and kicking,” said 78-year-old Alamelu in Srivaikuntam who voted in the August 18 byelections. AIADMK cadre were in a dilemma and had problems while distributing nearly two lakh handbills across five constituencies, asking the people to stay away from elections. Lack of faith in the state and central governments could not be sold as an idea when the independent election commission is conducting the elections, reasoned an AIADMK worker at the grassroots level. 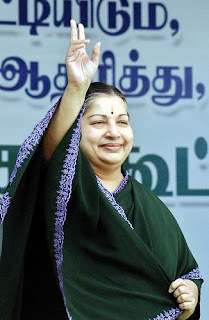 “People of Tamil Nadu are used to participation in elections. The elections of 1967 when the people said a resounding no to successive Congress regimes is one such instance,” he said. According to analysts, AIADMK chief’s call for boycott of re-polling for Chennai Corporation in February 2007 was the first mistake. The then boycott call drastically reduced the number of the AIADMK councilors in the strategically important Chennai corporation. The second boycott of August 18 byelections also has cost dearly for the largest Opposition in the state. MDMK and PMK have played second fiddle to the AIADMK and the people proved them wrong by actively participating in the poll process.